First published in 2001, this piece was written by Gregory Stephens for Jahworks.org. On the anniversary of Bob Marley’s birth, it made sense to re-publish. Twenty years after his death, Bob Marley is being embraced by the mainstream American entertainment industry. On February 6 (his 56thth birthday), Bob gets his star in Hollywood; on February 14, he is the subject of a documentary on the PBS “American Masters” series, and February 20 he receives a Lifetime Achievement Award at the Grammy’s. This is a sharp irony, given Marley’s fierce critique of the system now honoring him. The PBS documentary, Jeremy Marre’s excellent “Rebel Music ,” makes clear that Bob’s talents as an entertainer are among the least of the reasons why people are still talking about him today. Marley was a “real revolutionary,” on whom the CIA kept a file which it still refuses to release, for reasons of “national security.” He was the voice of a new world trying to be born, the face of international freedom movements, both political and spiritual. Today, Bob is a paradox: it is primarily as a spokesperson for underprivileged people that he has become a global icon, but his music and image have become thoroughly commodified in every imaginable way. Predictably, it is one of Marley’s most banal love songs, “Turn Your Lights Down Low,” that has been nominated for a Grammy this year (for Best Pop Collaboration), and will be performed at the Grammy’s by Bob’s son Ziggy, and his daughter-in-law Lauryn Hill. Which leads me to wonder: Is it possible that we can “love Bob to death,” in the way that Americans have transformed some national parks into virtual parking lots? Is Marley’s radical message being blunted by his popularity? Is he being reduced to a one-dimensional icon, in the way that we dispense with Martin Luther King, Jr. once a year with platitudes about his dream? Marley, who once sang that he had “no friends inna high society,” now has friends in very high places. Roger Steffens, the voice of Recording Academy which produces the Grammies, has been been nominating Marley for the Lifetime Achievement Award for the past 15 years. Barbara Barabino, the co-host of the “Get Up Stand Up” radio show on The Beat/100.3, has been lobbying for Marley’s star for years. Steffens is a renowned Marley archivist, whose exhibition “The World of Reggae and Bob Marley” is now on display at the Queen Mary in Long Beach. Barabino’s RaggaMuffins Productions produces the Bob Marley Festival at Long Beach Auditorium every February. A year after Time named Exodus its Album of the Century, and the BBC named “One Love” its Song of the Millennium, their efforts have finally born fruit. Having worked alongside both Steffens and Barabino, I think I can safely say that the Marley they have been trying to “big up” all these years is not precisely the same Marley that the Recording Academy is honoring alongside the likes of The Beach Boys, Tony Bennett, and Sammy Davis Jr., nor the same Bob whose star on the Hollywood Walk of Fame will tell us nothing more than that he was a singer. No, for many of us working in mainstream institutions, yet committed to a transformation of those institutions, Bob represents something far greater. I think that many of us hope that, once Bob has been brought into Prime Time, then like some latter-day Trojan horse, the secret cargo of his revolutionary ideals will spill out and transform those institutions from within. Rather utopian, of course, but also thoroughly in keeping with the philosophy of the Rastas, the culture which spawned Bob. They believe in a concept called Word/Sound/Power. That is, if you combine visionary words with seductive sounds, you get world-transforming power. Bob and the Rastas ritually refer to this as “Chant Down Babylon.” It’s a variant on the Bible story about the ritual demolishing of Jericho’s walls. But it’s got a curiously post-modern twist: Babylon is chanted down from within, because its youths get seduced by a music voicing a more attractive alternative to hedonism and consumerism. Now, “the system’s” talent for turning dead rebels-against-the-system into iconic cash cows is legendary. So one might ask: when tourists come to Bob’s star in Hollywood, who will tell them about the real Bob, the revolutionary, the prophet of racial equality, the fierce opponent of materialism and “spiritual wickedness in high and low places”? Bob Marley not only criticized a way of life that many of us recognize as destructive, he also voiced a more attractive alternative. In my book On Racial Frontiers, I list three main features of this alternative: non-racialism (One Blood); sustainability (living within the earth’s limits), and I-and-I consciousness (“the God within”). If we recognize that the Creator is everywhere, then there is no division between us and our Creator, no division between us and Creation. So we cannot hate other humans, and destroy creation, without hating and destroying ourselves. I think one of the most far-sighted aspects of Bob’s social vision is that he differentiates between revolution as oppositional fashion, and revolution as a true change of consciousness. This is illustrated beautifully in a filmed interview of Bob at the Black Studies Department of UCLA in 1978. A cofi cap-clad grad student asks Bob how he can claim to be a revolutionary, when he is a pop star, living in the West. Bob sometimes claimed he and his people were revolutionaries, “fighting single-handed with music.” But here he adapts the Gandhian principle that “an eye for an eye leaves the whole world blind.” Violent revolutions inevitably bring to power a “new boss” who, although previously oppressed, once in power, turns into an oppressor. This is the cycle of his-story. We have seen it in Yugoslavia. We have seen it in the tribal war between the Hutus and the Tutsis. The only way to break this cycle, Bob is saying, is through a revolution in consciousness. A revolution that goes beyond merely naming what it opposes, and learns to create a more attractive alternative. 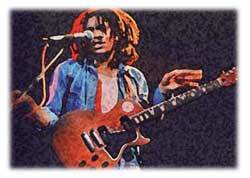 Bob’s more attractive alternative to the “Babylon System,” and “mental slavery” of all forms, he called Rasta. Last August when I was in Hollywood to do lectures and interviews about Marley, I spent some time reading the celebrities on the Walk of Fame. It didn’t seem like Bob’s crowd. On the one hand, as a supernova of the entertainment industry, he certainly belonged there. And yet Bob inhabited a different cultural and moral planet than most if not all Hollywood stars. Bob didn’t sing for fame or fortune (although he had both in spades). He sang “Songs of Freedom” for the emancipation of his people. After an assassination attempt, he told a reporter: “my life only has meaning if I can help plenty people.” In truth, the model Bob followed was not of individual celebrity, but rather a Biblical model of a “suffering servant” willing to lay down his life for his people. The blueprint for the path Bob followed can be found in Mark 10:43-–”Whoever wants to become great among you must become your servant, and whoever wants to be first must be slave of all.” This is a philosophy which is actually the opposite of the search for celebrity. Some say Bob died young, at age 36, because he never separated himself from the people whom he felt called to serve. He did not know how to say no: he lived and died giving, unconditionally. Today we would call that co-dependency. Self-glorification is a lot easier for us to understand than self-sacrifice. But it’s as true as ever, that there is no greater love than being willing to lay down your life for your friends. Especially friends who do not look like us; friends who have not even been born yet. Now imagine that becoming fashionable: self-sacrifice for the benefit of future generations. That would be something truly revolutionary.